Still inferior to 1% of all sales in Indonesia, e-commerce is expected to expand in high double digits in the coming years in Indonesia. Though the market is not as mature as e-commerce in Malaysia or Singapore, the Indonesian population of more than 260 million, makes the absolute numbers of growth in the country vertiginous, with millions of new online online shoppers every year. 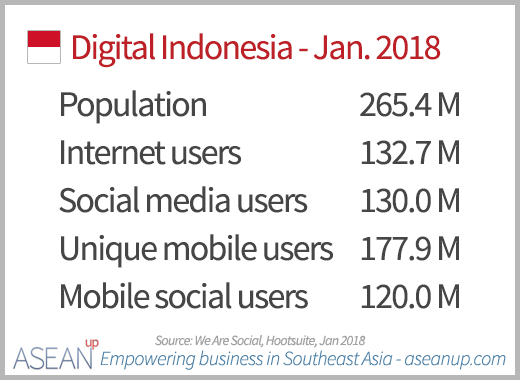 The fast growing Indonesian telecommunications infrastructure, its large population with a growing internet connectivity, especially through mobile phones, will make Indonesia the leader of e-commerce in Southeast Asia in a very near future. 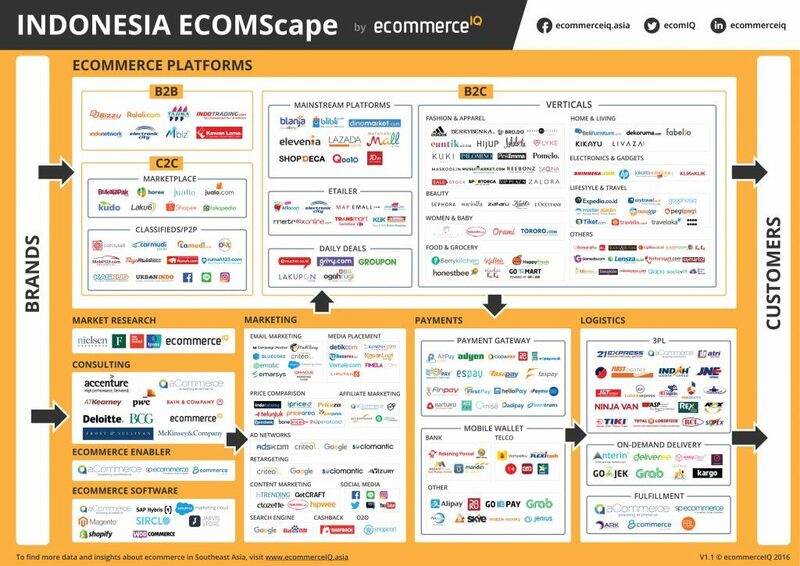 Providing an overview of the Indonesian e-commerce landscape, the following graphic regroups the different actors in each category. It gathers the most popular e-commerce players, platforms as well as services providers in the Indonesian e-commerce market, created by ecommerceiq. To go deeper in the trends that weigh on the market with data on the e-commerce shoppers’ profiles and behaviors, hot products and categories, preferred e-payment methods, the following presentation details the dynamics that currently shape the market for years to come. Modern retail is stronger in urban areas, while traditional retail holds its presence in rural areas. The convenience of online shopping attracts people to use it; and alongside with it, e-payment grows. The e-competition is growing fiercer, with companies striving to provide a better e-shopping experience. Addressing customers needs is the key. Is it possible to get a sample report about Indonesian e-commerce industry & Indonesian food industry? We currently do not publish reports on these subjects, but besides this post, you can also check at our post on the top Indonesian e-commerce sites.